I was making batik recently and thought I’d share a few before and after pics. They’re not an overly glamorous color, but I think they’re fun nonetheless. This is a “before” photo of a muslin dye rag that I used to clean up after dyeing fabric messes. The darker areas show the wax dots resist that I placed on the fabric with the end of a wooden dowel. This is the “after” photo of how it dyed. I like that some of the dots are different colors and in my next batch I am going to try to intensify the colors. This is just one more picture of a batik I created in this blue batch. This design was created with a found wooden craft circle that my awesome woodworking friend drilled some holes in for me. I wanted to test a wood stamp with interior areas/holes where I didn’t want the wax to end up. The wax adhered well to the wood and I like the effect. This piece started with a plain white piece of Kona pfd cotton. For this batch (and my previous attempts) I used dharma trading batik wax that is already blended into an awesome mixture that results in good cracking, etc. I liked the results, but I decided to branch out for a cheaper solution for the future. I ordered the waxes separately (parrafin and sticky wax) from dharma and will be dividing them up into the ratios of the batik wax myself. I’ll let you know how this goes! It’s A LOT cheaper, so I’m crossing my fingers. This is my weekly journal quilt 21/52 2008. Whew. It was less frustrating than last week’s! I decided that this week I wanted to try to work with a color that I am not obsessed with in my art right now. Pink. I started with a beautiful section of batik for the background. Next I added the batik circles for the flower tops. I then added some stems and grass. I fused all of this down and then went downstairs to paint it a bit. I painted the dots around the flowers with a small stamp I made out of an eraser. Last, I painted the inside of the flowers pink with a circle from a pre-made rubber stamp, then a smaller circle in teal or purple with a foam circle. I enjoy how the pink stamped circles have rough edges that match the batik circles. Then, I went back upstairs (my dog follows) and quilted it to the peltex base. I added a plain back and zig-zagged around the edges. Viola! It’s hard for me to see a piece that doesn’t really work for me visually as a successful piece. However, I’m sure my weekly quilt 20/52 2008 is just that. It is a success because I tried something new, and I’ll try something new again this week. It is a success to learn from what I’ve done before! Now I definitely know I made some good decisions on a recent larger work I made. I was using appliqued strips like in the journals above, but I shaped the strips into big wavy lines and spirals. I was planning to then cut them up and reassemble the piece, but decided against it. Looking at 20/52 2008, I think that the lines at angles other than right are just too much information and don’t become cohesive as in 13/52 2008. For me, that’s the point of my weekly art. I learned something! This is my weekly journal quilt 20/52 2o08, 6″ x 8″. I struggled with this week’s piece. I am working on a larger piece for a show right now. I am in the beginning phase of the larger project, which for me is a fun part, but a challenging time of really trying to refine the idea and edit what is/isn’t working. I had trouble using my brain for a separate design challenge! 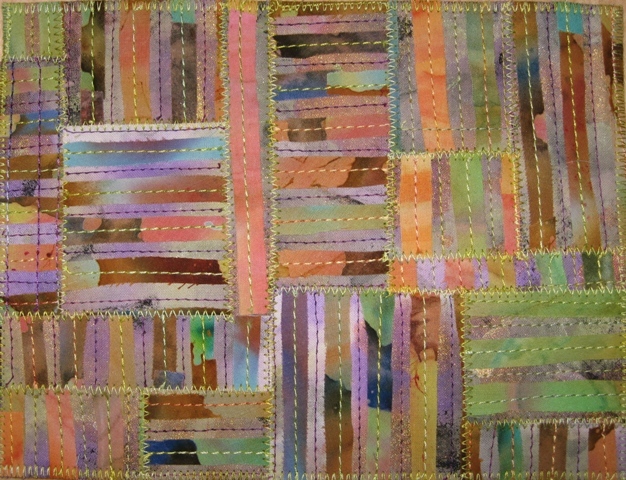 This piece is made of leftover quilted pieces from another recent project. There are areas painted with my handmade stamps and screen prints. There are also areas that are painted and then have small 1/4″ inch strips of fabric fused on top of the painted background. I cut up the pieces of quilt and then reassembled them and ziz-zagged them together. Last, I fused another piece of fabric to the back and quilted more lines to stabilize the piece. I finished the edges with a zig-zag stitch. This is my weekly journal quilt 19/52 2008, 6″ x 8″. It is basically a folded cut paper design that I cut out of fabric instead of paper! I folded the black fabric into 4 quadrants and cut out a variety of curvy shapes. I then unfolded it (yes, the fusible web I had already applied was a bear to unstick from itself) and laid it on top of a plain white background. I then stitched it to the peltex background. I decided it needed a little something more at this point, so I added a layer of black tulle and stitched it down as well. As often occurs, a happy surprise occured. I really love the stitching and shadows on the back of this piece. Here is the back of the piece held up to a light source. This is my weekly journal quilt 17/52 2008. So, it’s really no secret to most people that know me that I don’t enjoying mowing, or anything really to do with the lawn. I’d rather be inside with fabric. This week it has really rained and I really needed to mow. However, I thought it would be entirely more delightful to make my journal quilt about grass instead of actually mowing. The experience exceeded my expectations. I did mow later by the way…just in case our HOA is reading my blog. The background of this piece I painted a while back with one of my original speedy-cut stamp designs. On the whole piece back I cut stylized grass out of a beautiful piece of batik and fused them down. I then stitched and outline within each blade of grass with variegated 30 weight thread. P.S. There is a 20% off sale in my Etsy shop all day Monday May 5th!